All bathed for the second or third time that day and properly dressed for the evening in our white and blue sailor suits that were quite the fashion in 1939. No more playing outside after this. Too bad the tea tray has not yet arrived so we could see what goodies there normally were. I remember plates of light finger sandwiches and freshly baked cookies. 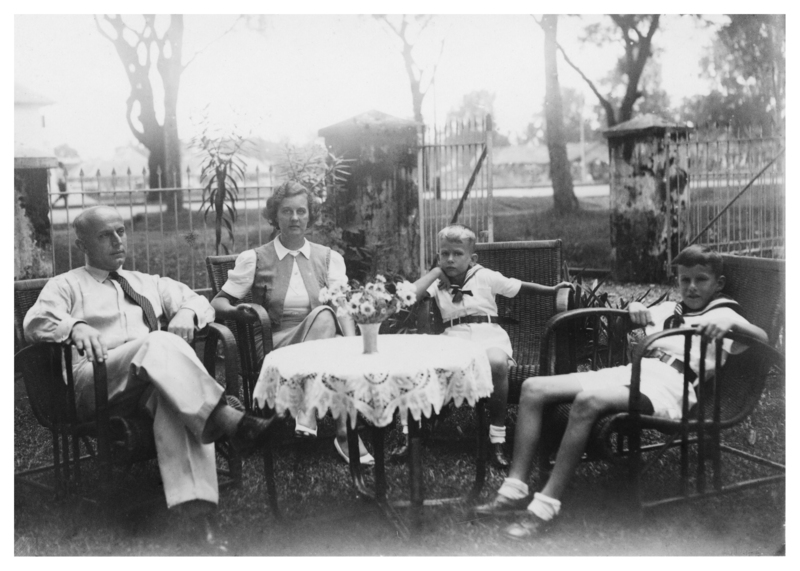 Every family that lived in the Dutch East Indies has photos like this in their family album, preserved by relatives in The Netherlands till after WWII as were all our photos that exist. It is easy to see why that time of day was photo opportunity time. Late afternoon when the heat of the day was starting to dissipate, allowing us to be comfortable fully dressed and spit-and-polished, the lighting just right, the whole of the family gathered for the evening. Had we had a dog at that time, our dog would have been in the picture too. Notice the moss and decades of weathering on the cement fence columns in the background. I loved our ancient house in Makassar, the first house in the Dutch East Indies that I remember. It is the setting of the first chapter of my book.